Until now, there was no straightforward and simple method for removing hydrogen sulfide iron from problem well water supplies. next-H2S media represents a true breakthrough in hydrogen sulfide treatment and surpasses all other methods. This extraordinary performance is made possible by the application of nanotechnology to a unique granular media. Atomic Level “nano-technology” on the surface of next-H2S granules enable extremely rapid catalytic reactions which convert hydrogen sulfide to filterable particles of insoluble sulfure. These particles are then easily filtered out by conventional backwashing media. Absolutely no oxidizing agents such as chlorine, potassium, permanganate or ozone are required. Furthermore, unlike conventional methods, the efficacy and efficiency of next-H2S virtually unaffected by pH or tempurature. The incorporation of iron into the media structure provides additional absorption capabilities for reduction of heavy metals and organic matter, which are common in well water supplies. Extremely Fast – next-H2S requires less than 20 seconds of contact time to convert H2S to filterable sulfur. In contrast, conventional catalytic media require contact times of 5 minutes and oxidative methods require contact times of up to 20 minutes. 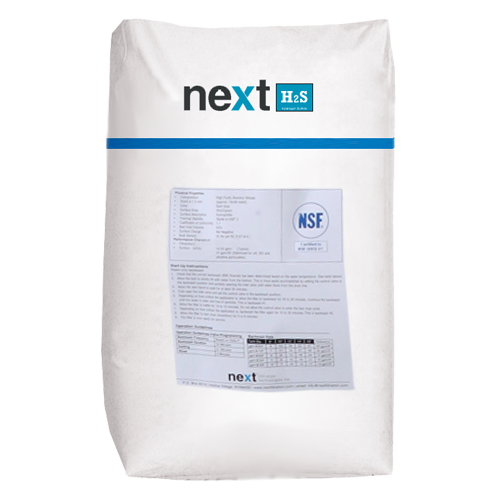 Handles extremely high concentrations – next-H2S removes up to 30 ppm of H2S. In contrast, conventional catalytic media are limited to about 8 ppm of hydrogen sulfide – higher concentrations require oxidation with 2 ppm of chlorine for ppm of H2S, with 20 minutes of contact time followed by media filtration. Stays clean and effective – Regardless of the level of hydrogen sulfide, periodic backwashing of next-H2S with untreated water is all that is required. In contrast, conventional catalytic media requires complicated and expensive system involving chemical feed, chemical regeneration and vigerous backwashing. Field Proven – next-H2S has performed successfuly since 2002 in over 750 installations. Compact System – Small domestic systems (<100god) can incorporate next-H2S and filtration in a single tank.